Three of the members who voted to oust her — Klas Ostergren, Kjell Espmark and Peter Englund — then announced that they would no longer work with the academy. A fourth member, Sara Stridsberg, has also threatened to leave. There is no formal provision for members to resign from the board and be replaced. Even before last week, two of the academy’s 18 members long ago stopped taking part and have not been replaced: One left in 1989 as part of a protest over the academy’s response to threats made against the writer Salman Rushdie, and another stopped taking part in 2015, saying that she did not feel she fit in. 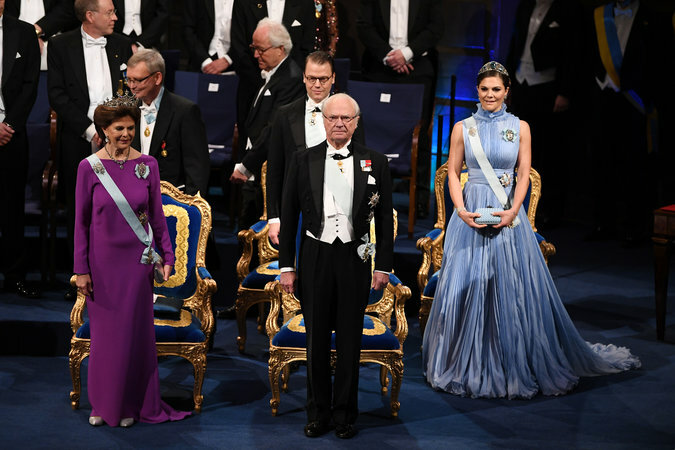 Queen Silvia of Sweden, left, King Carl XVI Gustaf, center, and Crown Princess Victoria at the Nobel Prize Awards Ceremony in Stockholm in December. The academy, founded in 1786 by King Gustav III, has 18 members who are elected for life terms. The current king said he might have to invoke his monarchical authority to alter the academy’s rules to provide for the replacement of members who leave the board. On Wednesday, Ms. Bylund told Dagens Nyheter that Mr. Arnault had sexually assaulted her in the early 1990s. His lawyer, Bjorn Hurtig, did not immediately respond to a request for comment. The controversy has exposed deep rifts within the academy. One member, Horace Engdahl, an admirer of Mr. Arnault, has called his three colleagues who left “a clique of sore losers” who should not have aired the internal disagreement in the public. “These sorts of indiscretions are more damaging to the academy than a Nobel Prize decision that has leaked out a few days too soon,” he said. Mr. Engdahl has also criticized the academy’s administrator, Sara Danius, the first woman to occupy that post. Ms. Danius, whom supporters describe as a force for reform and modernization, was behind the decision to hire the law firm. She has said little in public since the controversy erupted. As Mr. Engdahl’s comments rippled through the Swedish press this week, his ex-wife, Ebba Witt-Brattstrom, also rose to criticize him. She called the academy “incredibly patriarchal” and said that Ms. Danius was being bullied for being an outspoken woman.